I bought this guitar originally as a parts guitar for my Floyd Rose K Series Body and neck which I bought eons ago and still have not built into a full guitar. Sure, I spent time building a cheesey website featuring the project, but never actually got around to doing anything lol. Except buying lots of "parts guitars" that I could pull everything off of but the body. Well, it turns out that this Original FLoyd Rose does not fit the speedloader guitar bodies. Well the neck is the issue, actually. Doesn't fit in the neck pocket of the Redmond series K body guitar. I didn't find this out until after I bought it though. So the blue guitar you see in the picture, it was red when I bought it. It had some chips in it though and the paint job looked kind of crappy. It was red with sparkly glitter, and chips lol. So I thought what the heck, I will fix it up. Painted my electric guitar using duplicolor from the auto supply store. 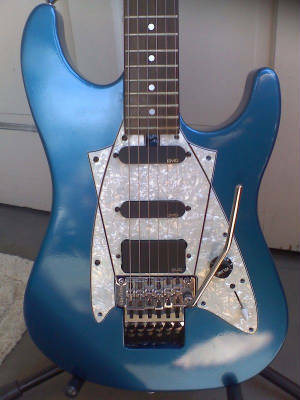 Now it's metallic blue Floyd Rose DSOT Electric Guitar with EMG active pickups! Sweet!